Located just off the A666 in central Bolton, Animal Trust Bolton Surgery operates 24/7 and is tremendously popular, providing care for thousands of pet owning households in the area but also regularly seeing patients from much further afield. The surgery offers free consultations together with high quality patient care, backed by not for profit pricing. The surgery provides emergency and inpatient care for its own clients and also for clients who usually attend other Animal Trust surgeries. Animal Trust Bolton is exceptionally well equipped with the ability to offer advanced ultrasound, x-ray and CT imaging. It has 4 operating theatres and capability in a wide range of soft tissue and orthopaedic surgeries together with full inpatient hospitalisation. Every month hundreds of successful procedures are performed at our Bolton surgery ranging from routine procedures through to complex orthopaedic surgery and life saving intervention. The site is staffed 24 hours a day with fully qualified staff who are devoted to the welfare of their patients. Aside from helping pets with complex medical and surgical cases, the surgery offers a full range of preventative, routine and minor ailment treatments through its outpatient and day procedure services and can offer a wide range of veterinary services to deliver the care a pet needs. 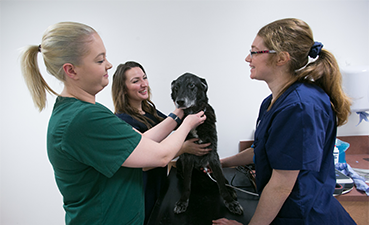 The Bolton surgery is staffed by a team of around 50 friendly, dedicated vets, nurses and support staff who are all united by a common passion for delivering quality services to their patients. Some of the team also hold more specialised qualifications in their fields of interest as a result of additional study. There is a large, private free car park immediately adjacent to the surgery.